Strobe lights. So I supposed "strobing" must be a form of heinous torture where beams of 50,000 lm/m2 were shone into prisoners' eyes until they watered and their retinas just gave up and burnt out, as described in The Gulag Archipelago. Overactive imagination, much? Turns out it is highlighting the face for a luminous look. If contouring "deepens" the shadow-areas and sculpts your face, strobing accentuates the brighter areas (apples of the cheeks, brow-bones, chin, centre of the forehead...) with a fresh glow. I usually prefer a matte look, as my face already produces enough oil to fuel a small country for a month. So I was leery of strobing at first. Chances of my looking like a female version of Edward Cullen, Esq. a glitter bomb? Very high, I decided, reaching for my favourite highlighter. Nothing ventured. 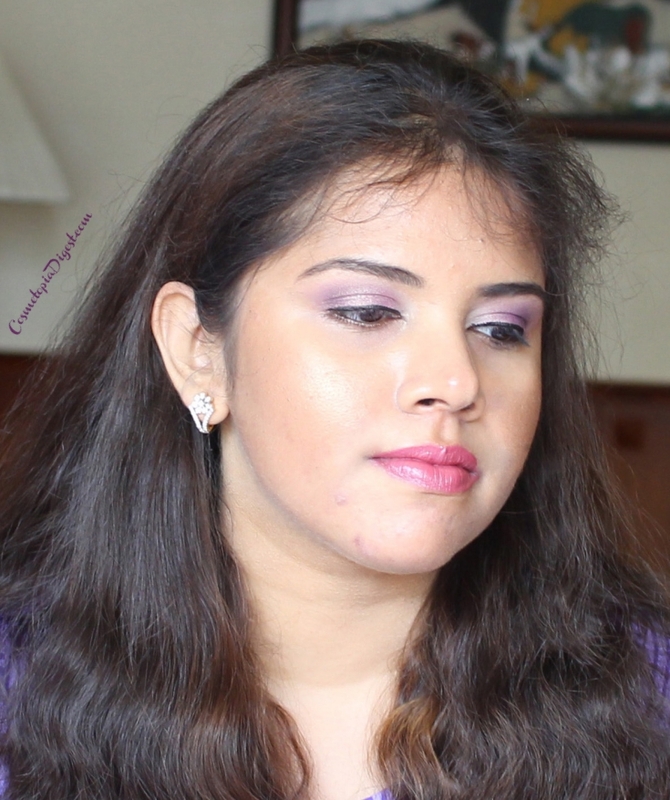 The products and method I used to achieve this strobed makeup look are detailed further below. G'wan, look. Strobing is easier than contouring - hurrah! On the other hand, strobing is not about applying half a dozen highlighters to your mug and channelling your inner sparkly unicorn. It is about accentuating the brighter areas of your face and making them stand out, thereby giving you an overall luminous glow. All it takes is one key product - a highlighter. You can either add a bit of liquid highlighter to your liquid foundation and then apply it all over the face. It is as simple as that. Or, you can use a cream or powder highlighter over your foundation, on your cheekbones, the bridge of the nose, the centre of the forehead, chin, and above your cupid's bow. For this look, I have used both techniques. I applied foundation over the chin and sides of the face and THEN mixed a drop of highlighter. Then, I used a bit of my favourite powder highlighter. Scroll down to find out what products I used, in what order. NARS All Day Luminous Weightless Foundation in Stromboli. I opted for a luminous foundation to begin with. Plus, this gives great coverage. Napoleon Perdis Auto Pilot Pre-Foundation Skin Primer. Non-silicone, non-mattifying. I got this sample from I-cannot-remember-where. So Susan Cosmetics Wonderlight Luminiser + Highlighter, from a So Susan Lip Love bag. I applied the primer to my moisturised and concealed (with NARS Radiant Creamy Concealer in Ginger) face and then foundation to the sides of my cheeks. I then mixed a drop of highlighter to the foundation and dabbed it on the face with a damp Beautyblender. At this point, I realised that my oily face would eat up the foundation and liquid highlighter during the course of the day and I decided to add something to lock the strobed look in place, without mattifying. So I proceeded to... (Scroll down). So I did the whole face and did not use setting powder. Instead, I applied my favourite highlighter ever - Bourjois Delice de Poudre Highlighting Powder in shade 53, which ACTUALLY smells like spiced chocolate - with the Everyday Minerals Blush Brush to the apples and top of the cheeks, bridge and centre of the nose, forehead and inner corners of the eyes. I did not bother with my chin because acne + highlighter = very bad idea = guaranteed laughter (for beholders). I felt it was a bit "flat", so I finished the sides of my cheeks with my favourite bronzer ever, Bourjois Delice de Poudre Bronzing Powder in shade 51, which smells of milk chocolate. It is subtle and has just a bit of shimmer for a nice glow. You can check out/buy the Bourjois Delice de Poudre range here (ships worldwide). Laura Mercier Eye Colour Quartet in African Violet, Violet Ink and Pale Pink, from the Flawless Eye Essentials Kit. I have to swatch this palette for you soon. African Violet is a duochrome. I cannot decide if it is more pink, gold or purple. Benefit Gimme Brow. I need a new tube; this one has almost run out. Thoughts? Would you rather strobe or contour?